Wouldn't you rather have the choice of when and how often you have to clean your windows? CleanFree glass is specifically designed to eliminate frequent, strenuous exterior glass cleaning. CleanFree is an application added during manufacturing that repels water and prevents the glass surface from being exposed to harsh elements that lead to damage and corrosion. 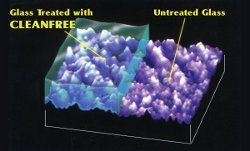 CleanFree fills in the open pores of the surface of the glass, making the glass clean and smooth at a microscopic level! This helps your windows stay clean for a much longer period of time. CleanFree is applied during the manufacturing process. So there is no mess involved whatsoever. Routine maintenance time is reduced because CleanFree surfaces are easier to clean and always stay cleaner longer. CleanFree protects against harsh elements that can cause damage to glass.